Matt Baker is an award winning comedian and odd skill specialist based out of Seattle Washington. He has performed his hilarious comedy stunt show all over the world and on numerous television programs including Last Comic Standing, The Late Late Show with James Corden, Tosh.0, ESPN, Comedy Central and on the NBC show America's Got Talent, where Sharon Osbourne called him “Hilarious” and Piers Morgan described him as, “hip, funny and well choreographed; the total package!” He has broken 5 Guinness World Records, was voted Seattle's Funniest Alternative Comic and has also performed overseas for American troops. Matt Baker's headline comedy show has been making colleges, corporate functions, festivals and special events just like yours fun and exciting for over 13 years. Matt has performed over 2,000 shows in 14 different countries and in every imaginable scenario. He is easy to work with, flexible and his show is self-contained which allows you to focus on the aspects of your event that actually need your attention. 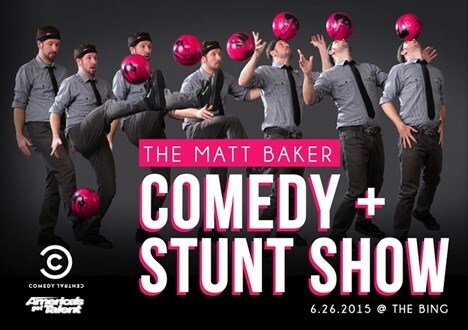 “Hilarious and amazing” is how the Seattle Times describes Matt Baker's comedy stunt show. Matt's show is a unique combination of a hilarious stand up comedy and amazing stunts. His hip, energetic, comedy stunt show is action packed with funny stories, audience participation and incredible skills that engage even the toughest crowd. His unique comfort level on stage sets the crowd at ease and allows them to want to be involved in every show. 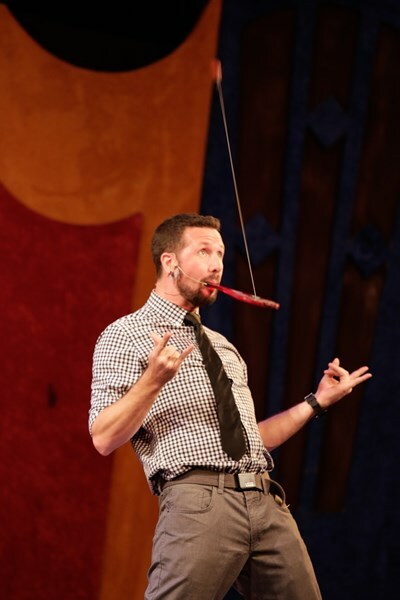 With clever comedy and jaw dropping stunts like catching a bowling ball on his head, balancing a horse on his face, spearing vegetables on spikes, escaping handcuffs and juggling with his mouth, Matt's show rivals no other. Matt even integrates custom material specific to your audience. Themes, products, messages, volunteers and inside jokes are things that will have your attendees talking about your event long after it's over. Weather it's performing his comedy stunt show or acting as master of ceremonies, Matt will provide you with the type of entertainment your event deserves: the best! There are many imitators, but there is only one Matt Baker. We were very happy with Matt. His show was great and our guests really enjoyed themselves. I would definitely book Matt again. Matt was very accommodating. Everyone loved his energy and the skill level that he had. I would definitely book him in the future and recommend him to others looking for great entertainment! Matt Baker was a perfect fit for our graduation party! The graduates all loved him (as did the parents)! Please note Matt Baker Comedy + Stunt Show will also travel to Bainbridge Island, Bellevue, Kirkland, Mercer Island, Port Gamble, Suquamish, Edmonds, Bothell, Mountlake Terrace, Bremerton, Kingston, Lynnwood, Poulsbo, Redmond, Everett, Port Orchard, Renton, Indianola, Silverdale, Woodinville, Keyport, Vashon, Issaquah, Olalla, Rollingbay, Snohomish, Hansville, Kent, Mukilteo, Seabeck.